ShipYourEnemiesGlitter.com sells for $85,000 on Flippa, and we have an exclusive interview with the new owner! Following up on one of Flippa’s most popular sales ever, we have an exclusive buyer interview with Peter Boychuk, the new owner of ShipYourEnemiesGlitter.com – purchased via Buy it Now on Flippa for $85,000. Peter gives us an inside look at the wildly successful viral site and what he plans to do to keep the glitter flowing in 2015! When I was 15 I worked at a grocery store as well as part time at a tennis club. Those two experiences were enough for me to realize that I hated working for other people, and I have been self employed ever since. When I was 16 I started selling on eBay. The more I sold, the more I loved working for myself. Things picked up quickly from eBay, and it wasn’t long before I had launched a number of successful eCommerce sites selling items ranging from designer wallets to auto parts. When I graduated high school, I studied at the University of Georgia for about 3 years, but ultimately dropped out because my online businesses were taking off. How long have you been using Flippa, and why do you keep coming back? I have been using Flippa since about a year ago. During that timespan, I have found that most of the high-end sites in the general marketplace seem to be right in my sweet spot in terms of price. I’m also a member of Flippa’s high-end brokerage service Deal Flow, and I purchased WHMCSDesigns.com using that service last September. My background is primarily eCommerce, and things such as sourcing, fulfillment, process management, and customer service are my strongest skills. 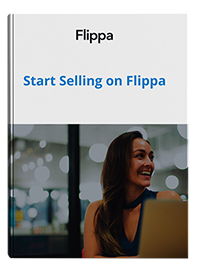 As such, I monitor Flippa’s listings daily looking for listings where I can put those skills to work. In short, ShipYourEnemiesGlitter.com is glitter as a service. The idea is that customers can send glitter-filled letters to people they dislike (or to friends as a prank) for only $9.99. The result is that the recipient unknowingly opens the letter, and glitter gets everywhere. A crazy Aussie developed the idea while on holiday, and did an absolutely phenomenal job marketing it. Within 24 hours the site had generated over $20,000 in orders and millions of unique visitors, and it was also mentioned by nearly every major online media outlet. In his own words, “he never expected such a massive response” and he “quickly became overwhelmed” putting the site up for sale. How did you discover the site? And, why did you ultimately decide to place a bid? I first discovered Ship Your Enemies Glitter while performing one of my regular searches on Flippa. What caught my eye was the fact that bidding was already up to $60k with hundreds of comments and bids, and this is something I had never seen before. That said, I had no initial plans to buy the site, but I continued following the listing. As the auction moved closer to the end and the price floated around $70k I started to take more notice. I have a fully staffed warehouse for my other businesses, so I knew it would be relatively easy to add glitter fulfillment to our repertoire. I created projections, and based on the conclusions I drew, it was really a no brainer – I had to place a bid. I think a lot of people thought this was just a fly-by-night business, but so far, that hasn’t been the case at all. Since taking over, sales and traffic have been steady. Moving forward, we plan to keep the overall concept, simplicity, and tone of the site. However, we’ll also be adding a ton of value and continually developing our products and refining and improving our processes. We have an extensive list of new ideas that we plan to roll out, and since launch we have already added the option to pay with a credit card, double the amount of glitter, and include a custom note. In the coming weeks and months you can expect to see mail tracking and Bitcoin payment options, as well as the release of a blog and an app. In short, we’ll continue to be not only the most popular glitter delivery service on the internet, but also the best.